Using his Apple millions and funding from Ross Perot and Canon, Jobs founded NeXT, a computer company that was even more Jobslike than Apple had been. Built in a state-of-the-art factory and sporting a logo by legendary designer Paul Rand, the NeXT system was a sleek black cube packed with innovations. Unfortunately, it was aimed at a market that turned out not to exist: academic types who could afford its $6,500 price tag. After selling only 50,000 units, NeXT refocused on software. Jobs later called the NeXT-Pixar years "one of the most creative periods of my life" and said his dismissal from Apple had been "awful-tasting medicine, but I guess the patient needed it." It was also the time when he went from high-profile bachelorhood  he had fathered a daughter out of wedlock and dated Joan Baez  to family man. He married Laurene Powell in 1991; by 1998, they were the parents of a son and two daughters. Meanwhile, Apple sans Jobs was failing on an epic scale. Sculley had given way to a vision-free German Apple executive named Michael Spindler, who was replaced by Gil Amelio, a veteran of the computer-chip industry who was spectacularly unsuited to run Apple. He presided over $1.8 billion in losses in Apple's 1996 and '97 fiscal years and failed to sell the company to interested white knights IBM and Sun MicroSystems. The possibility of Apple running out of cash and ceasing to exist was not unthinkable. NeXT's software came with a bonus: Steve Jobs. In a touching sign of naiveté, Amelio apparently thought Jobs would cheerfully serve as a figurehead for the company he had co-founded. Instead, six months after the merger, Jobs orchestrated Amelio's ouster and accepted the position of interim CEO  iCEO for short  splitting time with his Pixar duties. "I'm here almost every day," he told TIME in 1997, "but just for the next few months. I'm really clear on it." He finally ditched the i in iCEO in 2000. Jobs' return cheered up beleaguered Apple fans, but few industry watchers expected miracles. "[T]he odds aren't good that he can do more than slow the fall, perhaps giving Apple a few more years before it is either gobbled up by a bigger company or finally runs out of customers," wrote Jim Carlton in 1998 when he updated his 1997 book Apple: The Inside Story of Intrigue, Egomania, and Business Blunders to reflect Jobs' comeback. 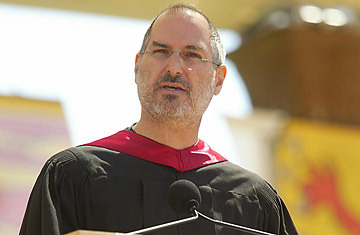 Jobs rolled out an advertising campaign  "Think Different"  that got people talking about the company again. And he presided over the release of the striking all-in-one iMac, which came in a translucent case crafted by Jonathan Ive, the British industrial designer who would be responsible for every major Apple product to come. In 1998, it became the best-selling computer in America. See a brief history of the computer.